Experiencing the World's Religionsprovides a clear and compelling account of religion as a diverse, lived experience by peoples around the world. Global in its coverage, the text conveys the vitality and richness of the world's religions as a living cultural wellspring that not only concerns systems of belief but how those beliefs are expressed in ceremonies, food, clothing, art, architecture, pilgrimage, scripture, and music. The text demonstrates why an understanding of the world's religions enriches our lives. In an engaging narrative emphasizing the experience of religion, the text takes students on a personal voyage through doctrines, history, the religiously inspired arts, ceremonies, and everyday expressions of belief and combines these with powerful photographs from around the globe. 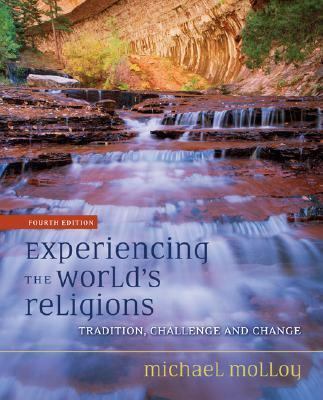 The text goes beyond traditional approaches to personally connect students with the vitality of the great religions and how they reach into the lives of individuals and the culture at large. This fourth edition has been thoroughly updated in both content and illustration, to address recent world events and political changes, and provide additional insight into current theory and practice.Molloy, Michael is the author of 'Experiencing the World's Religions Tradition, Challenge and Change', published 2006 under ISBN 9780073535647 and ISBN 0073535648.